Following on the heels of a Whitworth team taking first place at the National Intercollegiate Ethics Bowl in March, two students have brought home the first individual national titles in a speech or debate event in school history by winning the International Public Debate Association's national tournament, held April 13-15 at Sam Houston State University, in Huntsville, Texas. The wins cap off a strong first year for the university's forensics program, which re-launched last fall after a 14-year hiatus. 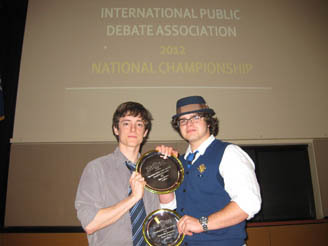 Travis Walker, '12 (left), and Jacob Wilson, '15, were declared co-national champions after they both won semi-final rounds at the national competition, which included 94 student debaters from 28 schools across the country, including the University of Tennessee, Louisiana State University, Union University, and Sam Houston State University. The Whitworth team won a total of six awards at the tournament, as Krister Johnson, '13, advanced to the quarterfinals, and Rachel Busick, '12, Sam Director and Laryssa Lynch, both '15, all advanced to the round of the top 32. Team members also included Dee Ingram and Jonathan Kim, both '15. "Both Travis and Jacob have high school debate experience that gave them a solid foundation for academic and forensics success at Whitworth, and both have worked hard at their craft this debate season," says Mike Ingram, director of Whitworth's forensics program and associate provost for faculty development and scholarship at the university. "Whitworth's liberal arts education enables our student debaters to draw quickly from a broad range of ideas they have already studied. In addition, the interdisciplinary nature of our forensics program means that we have students from a variety of majors, so teammates can help each other better understand key ideas in wide-ranging debate topics." The International Public Debate Association promotes a form of debate that emphasizes clear argumentation, sound reasoning and excellence in public speaking. Students, who debate in a one-on-one format, select a topic from a list of five possible topics and then are given 30 minutes to prepare their arguments. The national tournament is divided into three divisions. Whitworth students competed in the novice division, which is reserved for students participating in their first year of college debate competition. Students in the novice division tournament this year debated a variety of subjects, including ethics in public journalism, freedom of expression for military personnel, taxing online businesses, and the proper role of skepticism. The university's revived forensics program is off to a strong start, as students have won sweepstakes awards at six of the eight tournaments they have participated in this year. Sweepstakes awards are determined by adding the number of points received by each person on the team to determine the total number of points the team has earned. The team is coached by Ingram, who says this is the first time he has coached national champions in forensics since he started coaching in 1984. Mike Ingram, professor of communication studies and associate provost for faculty development and scholarship, Whitworth University, (509) 777-4428 or mingram@whitworth.edu.